Cancer treatment can be emotional, scary and exhausting. For 21-year-old Liam, having chemotherapy at home has made all the difference. There are times in life when you really need a cheer squad. For 21-year-old Liam Parkes, an apprentice mechanic living in Perth, this hit home harder than ever in January this year, when he was diagnosed with Hodgkin’s lymphoma. Everything seemed to be put on pause. His world was suddenly uncertain, saturated with the day-to-day realities of treatment. One thing was clear though – he wouldn’t be facing this alone. Liam has a fiercely loyal support network, with his parents, Alison and Nigel, his sister, Ebony, his best mate, Kade, and his beloved dog, Jack, all by his side. From the beginning, his treatment and recovery was a challenge they’d all take on together. Like many people going through cancer, Liam has been receiving chemotherapy as part of his treatment plan. Chemotherapy is designed to destroy cancer cells or slow their fast growth. There are different types of medications that can be used, and often it’s a combination of several drugs. This can depend on a number of things like the type of cancer, how advanced it is, its location in the body, and other factors like your age and general health. The medication is usually given intravenously. This can be done through a cannula (a thin tube, usually placed in your hand or arm), or more commonly through a central line or port (special tubes placed in a large vein, usually in the chest or neck). It can also be given as tablets that you swallow. The number of chemotherapy sessions needed can vary. It may be daily, weekly or monthly, given in courses or cycles with periods of rest in between to allow normal cells to recover and the body to regain its strength. Some people will have courses of chemo over a period of 6-12 months. It can be given as an inpatient in hospital, but more often it will be an outpatient treatment. Chemotherapy itself shouldn’t cause much pain. But while the medication destroys rapidly growing cancer cells, it can also damage healthy cells, which can lead to some uncomfortable side effects. Fatigue, nausea, vomiting, diarrhoea, mouth sores, dry eyes and muscle weakness are all possible. And of course, it can cause hair loss, which can be distressing. Not everyone will experience these side effects, and there are lots of options to help manage them. But no matter how well the treatment is tolerated, and how positive your outlook, it can definitely be an exhausting and emotional experience. Hospitals are places of care and recovery, well equipped to look after you during a difficult illness like cancer. But when you’re feeling overwhelmed and scared, sometimes all you want is the comfort of your own familiar surroundings. Liam’s mum, Alison, started looking into options that might make the experience more bearable. She came across Chemotherapy at Home, a trial program being offered by Medibank. “You never, ever want to hear that your child has cancer. We can’t change it – all we can do is try and make it more comfortable,” she says. For Liam, it gives him back a sense of control he felt the cancer had taken away from him. “Having chemo at home means it’s on my terms,” he says. “Having to go to hospital, that day on your calendar is written off. You've got six months of just doctors, chemo, scans, whatever – it all just keeps stacking up. It also gives him more freedom to keep doing all the normal things he loves – like playing with his dog, working on his car in the garage, or hanging out with his mates at the beach. “Being at home, it’s much easier. I can wake up five minutes before my chemo starts, jump out and roll onto the couch. I get plugged in and I just sit and chill out for an hour. Having that bit of normality is good. Having treatment at home isn’t right for everyone – but the important thing is giving more people the choice, where clinically appropriate. “Medibank at Home is about empowering our members with greater choice, control and flexibility around where they receive their care,” says Medibank Chief Medical Officer Dr Linda Swan. Just getting to the hospital can be challenging for many people. In recent Medibank research, two thirds of Australians who had been to hospital said getting to and from their treatment was a major source of stress. One in four have even had to cancel or reschedule appointments because of difficulties in getting there. 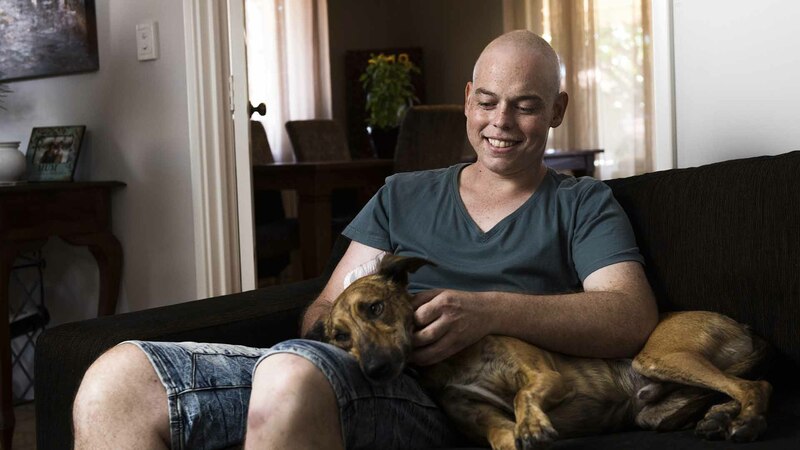 After a successful pilot in Western Australia, the Chemotherapy at Home trial has been extended to South Australia, Victoria, New South Wales metro and Queensland metro. It’s hoped that early encouraging results will lead to a national roll-out, giving more people the choice to receive care where they feel most comfortable. This would join the Rehabilitation at Home program, which is currently available to all eligible Medibank members following total hip or knee joint replacement surgery. Medibank is also currently trialling Palliative Care at Home and Haemodialysis at Home, with hopes to add more services in future. Want to know more about Medibank at Home? To find out more about these programs, visit Medibank at Home.